When the weather was cooler and I had a rather large celeriac root arrive in my veg box I decided to invite a friend over to cook up something nice with the celeriac and watch Black Swan. Incidentally I recommend them both: The movie and the following dish. You’ll notice that I haven’t removed the orange part (or the coral) of the scallop. Puritans may suggest you do but I think they taste pretty good so at least try some before you discard it. Peel and chop your celeriac bulb into small pieces. Get a medium saucepan on the stove at medium heat. To this add your chopped celeriac and cover with just enough milk. Bring it to a boil until it all softens up (around 10 minutes). When it’s nice and soft, season with salt and pepper and blend it all up with a hand blender. Add half the butter and the cream and simmer it down on low heat with a lid on until it reaches your desired thickness – or conversely, add more liquid until it reaches your desired thickness. Constantly taste and adjust your seasonings. Keep it warm and set it aside. While that’s happening, cook up and render down your lardons in a small frying pan on medium high heat until nice and crispy. Add a pinch of paprika and maybe some cracked black pepper. When they are nice and crisp, keep a tablespoon or two of their fat for the scallops then set them aside in a slightly warm oven to keep warm. You’ll want to warm some serving plates too, so get those in there. In a large non stick pan, get it up to medium to high heat. Add the reserved lardon fat and the rest of the butter. When the the fat starts to brown, add your scallops in a clockwise orderly fashion so you know which ones are taking in the most heat. Sear these for 30 seconds to 1 minute on one side and flip ’em over for 20 seconds or so. 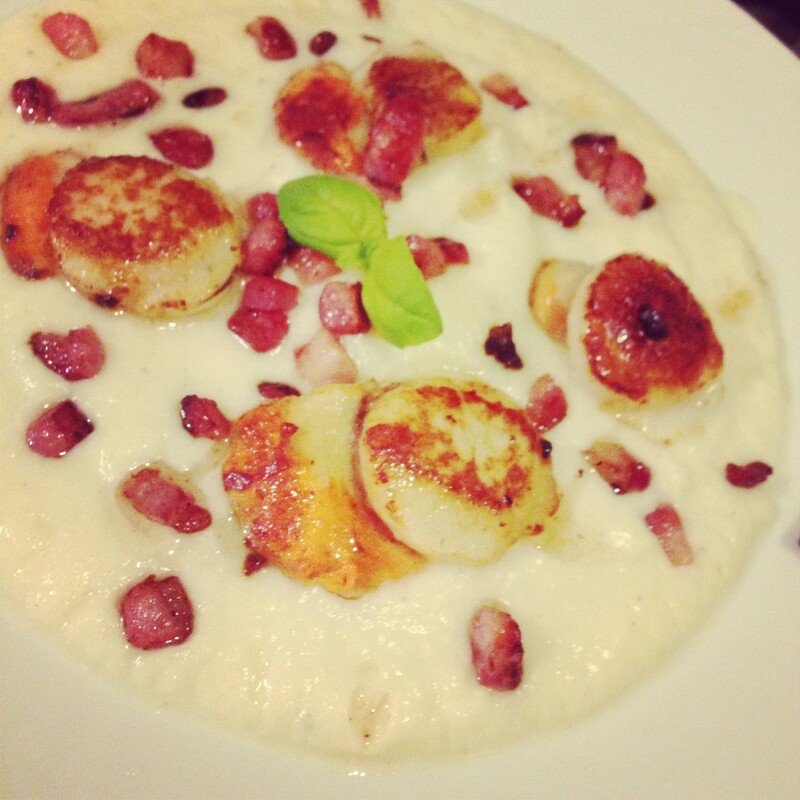 You may need to do you scallops in batches depending on how big your frying pan is. Get your pre-warmed plates out and serve up. Purée in the centre of the plate, scallops on top. Sprinkle liberally with the lardons and their fat. Maybe a sprinkle of sea salt flakes. Basil to garnish. 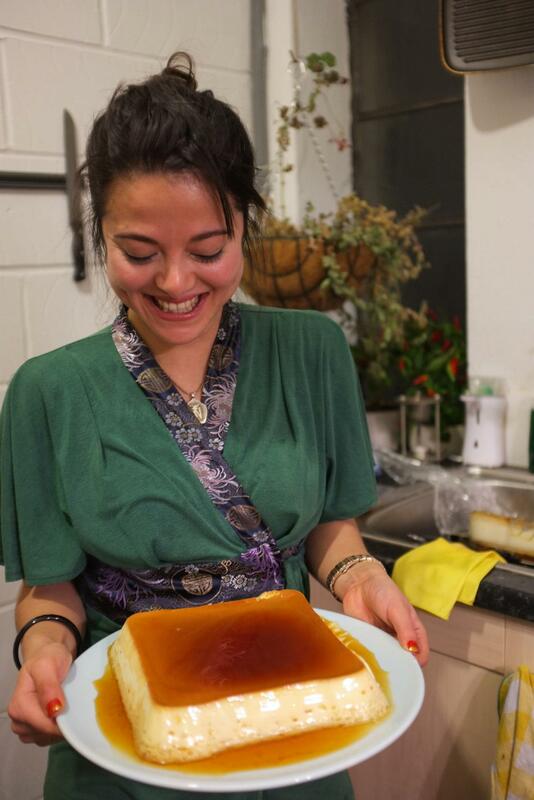 So a while ago as I was doing the New Year’s Detox I wrote about this mega easy caramel flan I made for my family over Christmas back in Hong Kong. It went down a treat, but for my Mother and myself it just wasn’t the soft delicious delight we were hoping for. 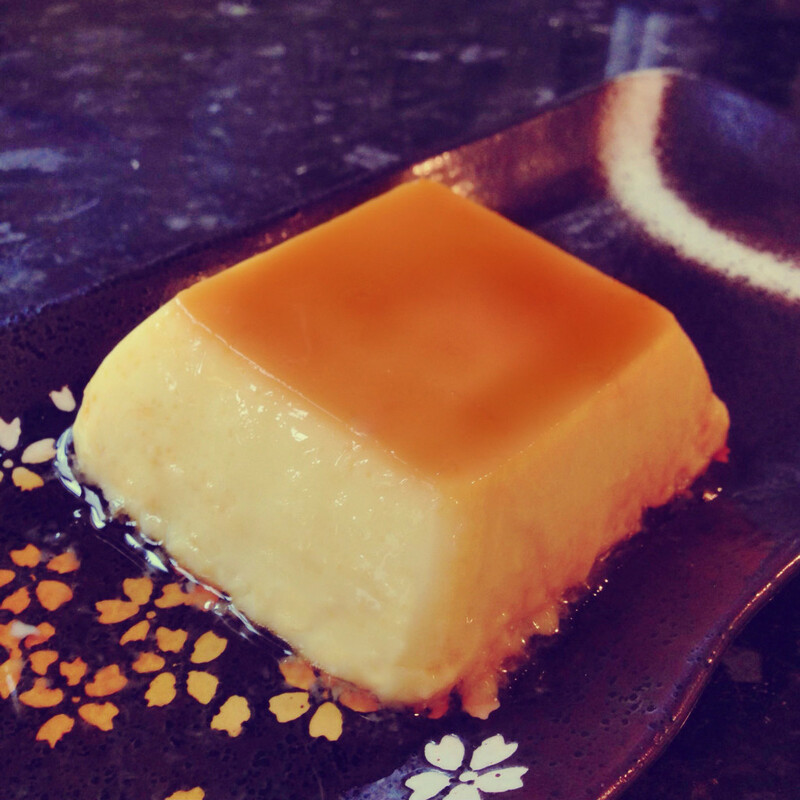 Which made me try rather a lot of creme caramel recipes of late and I’ve been working on one that is not only soft and delicious, but doesn’t liquify upon turning out. It’s probably not *perfect* but it seems pretty fool-proof so far so I thought I’d share it. I made a massive one of these to finish off my Chinese New Year party (and probably my guests too), and I’ve also tried substituting the milk for not only rice milk, but soya as well, and I’m pleased to report that it works superbly. Makes enough for 6-8 ramekins. Oven at 170°C. Get a heavy bottomed non stick pan on to high heat. Into this add the 115 g of caster sugar and the tablespoon of water. Caramelise your sugar and be careful not to burn it, I like to just let it sit for ages taking in the heat while I work on other things. I’ll only start to stir with a metal spoon right at the end browning process. While the caramel’s on the stove, put your ramekins in a deep enough tray to use as your water bath. But without any water in it for now, put it in the oven so your ramekins take on a good amount of heat. This is so when we spoon the caramel into them it doesn’t seize up. Take your tray of hot ramekins out of the over when your caramel’s about done, then quickly and carefully spoon about a tablespoon of caramel into all the dishes. Move them about a bit to evenly coat. Set them aside. In another pot, bring the milk and vanilla to just below boiling point. If you’re using a whole vanilla pod, don’t forget to slice along it length wise. When at heat remove from stove and set aside. Get a large glass bowl and mix together all your eggs and the remaining sugar. To this use a fine mesh sieve and quickly whisk and incorporate the hot milk. When it’s all mixed together you may get a lot of foam on your custard mix. I like to place a kitchen towel on top to remove this. Ladle some custard mix into each of the ramekins. Remove any extra bubbles with the kitchen towel as above. Place all the ramekins in the water bath tray and fill it with some boiled hot water so that it’s at least over the half way point of the ramekins. Now into the oven for 20-35 minutes. The creme caramels should have some wobble in them still, but set. Some may have a solid skin atop of them. If you’re really fussy (I am) and the top membrane is thick enough, carefully remove this then let them cool and get them in the fridge ready to be served. The longer you leave them in the fridge the better I think because the caramel dissolves more. When you’re ready to serve, run a sharp knife all the way around and turn it out on a plate. And that’s it! This also brings an end to all the dishes I made that snowy sunday evening to usher in the Year of the Snake. So I’ll be on to regular kitchen experiments from now on. Right! Here we go. The quintessential dumpling post that any Chinese person worth their salt needs to have up their sleeves. These were made on the day of Chinese new year, and thank goodness for my friends helping to wrap! The meat and veg are easily interchangeable, be it pork, chicken or even lamb, with some sort of leafy cabbagey veg (pak choi, Chinese leaf, cabbage). I’ve gone for the absolute staple combo of pork and pak choi. The wrapping technique I’ll be showing you here isn’t actually my preferred technique, but it’s your ‘this is what a dumpling looks like’ so it’ll be nice to start there before we advance to other styles right? I can actually make the wraps for this, but for the purposes of simplicity get yourself some wraps from your local Chinese supermarket. I’m also teaching you the Chinese style of pot stickers, not the Japanese ones. Which, to be fair is only really a difference in dumpling skin thickness. The nice thing about the Chinese thicker wraps is that they’re a bit more forgiving with the wrapping and can be boiled vigorously for a delicious water/soup variety of dumplings (水餃). The following makes around 30. Finely chop all your veg. Get everything (bar your dumpling skins obviously) into a mixing bowl and mix and squeeze everything with your hands. No messing about with a spoon or whatever. It’s quite hard to give you guys ‘proper’ veg weights as I like to eye ball my proportions. But basically you want a meat to veg ratio of around 60:40. The more veg the better I think, but you want there to be enough meat to bind it all together. Mix with your hands for around 5 minutes. 1. Place a wrap flat on your hand. 2. Add about 1 tablespoon of mix in the centre. 3. Dip your finger into the water and make a ring all the way around the edge for your seal. Fold in half. Seal it and make sure there are no air bubbles. 6. 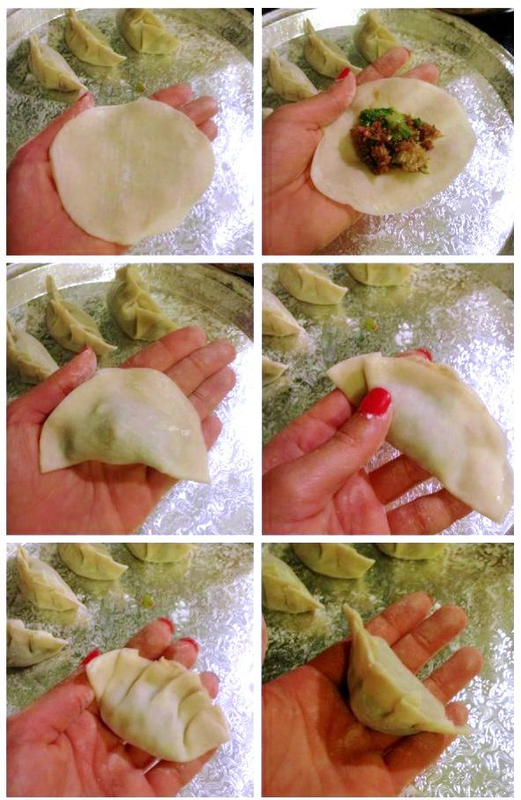 Take your dumpling by the pleats and gently press it onto your work top to form that flat base and curve it so it looks more crescent like. Yay! Dumplings. 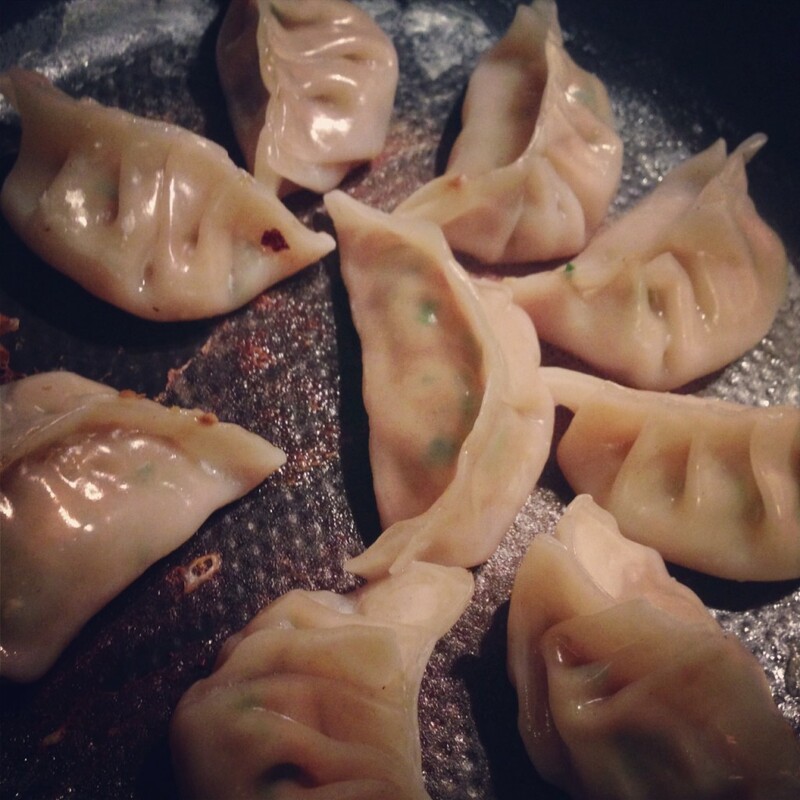 So now that you’ve got all your dumplings, let’s turn them into delicious pot stickers. I hope you have a really decent non-stick frying pan with a lid, because you’ll need that lid to steam. The key to these is to NOT TOUCH THEM. I can’t emphasise that enough. Just trust that they are cooking okay? You can only move them when they are cooked and have a firm enough base to move. 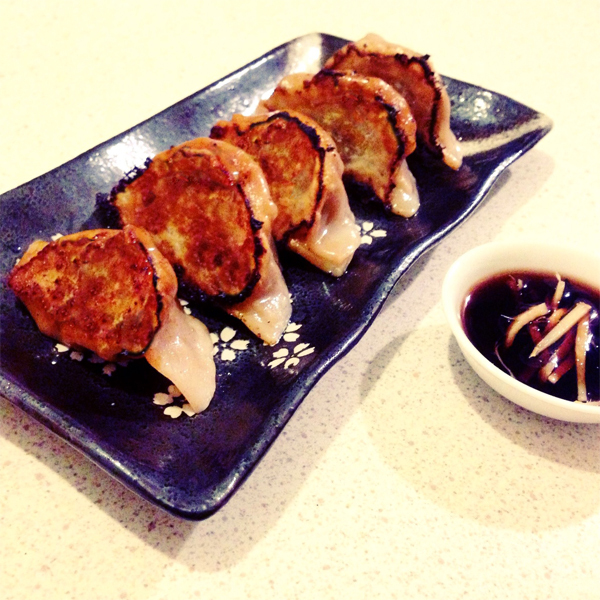 They aren’t called pot stickers for nothing. Heat at medium high, frying pan on. When at heat, add a tablespoon of vegetable oil (corn or rapeseed good) and evenly coat the base. When the oil is nice and hot, add some dumplings. Space them out a bit they’ll expand, I also like to add them in a clockwise array just so I know which ones have been taking the heat longest. Now you’ll want to not touch these and let the bases take on a bit of colour, maybe 3-5 minutes? Now add enough water so that there’s a centimetre of liquid in the pan. Lid on. Heat up. Bring that liquid to a boil to create a load of steam. Steam for around five minutes. At this point the water is evaporating out of the pan or you’ll need to take the lid off to evaporate the rest of the water away. Once the water is almost all evaporated, take a wooden chopstick or skewer and carefully run it around each dumpling to remove any access gloopy flour. Turn the heat down to medium high again (or even medium if that’s too scary) and get those bases crunchy. Another 2-5 minutes perhaps. At around this stage I like to give my pan a bit of a shake to loosen them up. Carefully lift to see what their colouring is like, you want nice and golden brown, not burnt. Keep frying them until they’re nice and crisp. Serve up! I like having these with some Chinese black vinegar and freshly sliced ginger, but a huge jar of chilli is never too far away. If you have any spare, place them separately on a lightly floured tray in the freezer until solid. Then pack them all up in a bag. Nothing nicer than a lazy evening when you suddenly remember you have a few of these bad boys ready to go. If you’re cooking from frozen you can follow the above instructions, just have them on the first fry time a bit longer.